Over two and half years after a court-ordered settlement, a July 2014 compliance report again shows almost no progress by Newark Public Schools (NPS) in improving the delivery of services to students with disabilities. This ongoing failure has prompted the NJ Department of Education (NJDOE) to impose a Corrective Action Plan (CAP) on NPS to address recurring problems with staffing and oversight of the district’s special education program. The settlement in a class action lawsuit brought by Education Law Center, with the pro bono assistance of the Gibbons law firm – M.A. v. Newark Public Schools – directs NPS to implement measures to ensure students with disabilities receive special education services in a timely manner and obtain “compensatory education” for services they missed in the past. The settlement requires NPS to put in place a comprehensive special education database, provide staff training, and regularly report on compliance activities. The settlement also includes guidelines for corrective action if warranted, and requires an independent third party to monitor district compliance. I know there's quite a bit that State Superintendent Cami Anderson has to answer for, but this really is just about the worst dereliction of duty you could imagine for a school leader. These children are the most needy and the most vulnerable students in the system; they should be the first priority of any superintendent. Apologies for the ugly color scheme. I describe the methodology briefly below; what we've got here are two pretty good estimates of how the different types of eligibiltities are spread out among Newark's students. The various shades of gold are higher-cost disabilities: Autism, Deaf-Blindness, Emotional Disturbance, Hearing Impairment, Multiple Disabilities, Intellectual Disability, Other Health Impairment, Orthopedic Impairments, Traumatic Brain Injury, and Visual Impairment. In aqua we have lower-cost disabilities: Specific Learning Disability, and Speech or Language Impairment. I have unknown disabilities in purple: we don't know these because the NJDOE suppresses data to protect the privacy of students when the numbers reported are low (below five). It makes sense that the charters would have more unknown students, because their overall enrollment numbers are smaller than the entire NPS district. I extrapolated what those unknowns would be using a most-generous case scenario, assuming students with unknown disabilities would be equally distributed among all possible eligibilities, no matter how high the cost. In either case, the contrast is clear: NPS is serving more of the students with high-cost disabilities, while the classified charter students largely have low-cost disabilities. I don't necessarily fault the charters for this: in most cases, it would be inappropriate for them to attempt to serve children with the highest-cost disabilities. I doubt very few charters can adequately educate children whose classification is Traumatic Brain Injury or Deaf Blindness. Some students who are classified as autistic may be able to integrate into a charter school classroom; others very likely can't. It would be a very poor allocation of resources to replicate the services available to students with high-cost needs in every school -- charter or not -- within a "choice" district. ELC has notified NJDOE that the State’s corrective action plan does not go far enough to address the systemic problems with NPS service delivery. Specifically, ELC is asking NJDOE to direct NPS to provide a line item budget for special education services that identifies all child study teams and other essential staff used by the district, with evidence demonstrating that the staff-to-student ratios within the budget are consistent with accepted practice standards in the field. ELC will meet next week with NPS and NJDOE to discuss ELC's objections. There's been a lot of talk lately about charters not getting their "fair share" of funds; there's far less talk about how those same charters shouldn't get a similar share of dollars when they don't educate the same types of kids. Down in Camden, the new "Renaissance" charters will get 95 percent of the per pupil funds from the city school district for each student enrolled. The NJ Legislature overwhelming thinks this is a great idea; what they didn't stop to consider is what happens when the funding needed for the children who can't be served by charters leaves the public district. How can children with high-cost needs be served when the charters are disproportionately draining the funding they need for their educations? They can't. 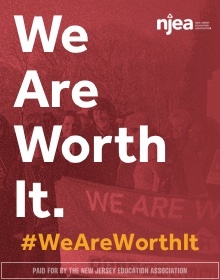 In their ideological zeal for market-based education, the reformy types are running a real risk of draining the funds necessary to educate students for whom "choice" is not a choice. 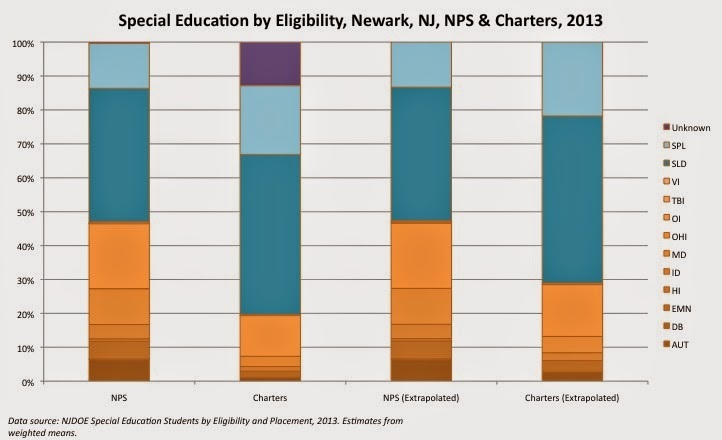 There is a very good case to be made that charter school proliferation is contributing to Newark's inability to educate special needs children. Unless Anderson can show right now that she is capable of serving these deserving students, her plans for charter expansion should be halted -- immediately. 7 placements by 12 eligibilities yield 84 cells of data for each school district or charter school. Counts of 0 are not suppressed, which means that if the cell does not contain a 0 or a number higher than 5, we can assume it contains some number between 1 and 5. The sum of all the numbers in all 84 cells, however, cannot be greater than the total count of classified students ages 3 to 21 for the district or the charter school. It also cannot be greater than the total for each district or charter calculated from the “Percent of Classified Students by Placement, Ages 6-21” file (assuming no cells are suppressed in that file). So the highest possible total of age 6 to 21 classified students is either the total of all non-suppressed students and 5 students for each suppressed cell, or the total count of students classified ages 3 to 21, or the total placement count of students classified ages 6 to 21, whichever is the lowest. Since we know every suppressed cell has a count of at least 1, and since we know the highest possible total count of age 6 to 21 classified students, we can calculate the number of unknown students – the highest possible count minus the known students and 1 for each suppressed cell – in the most generous scenario possible. To make the extrapolated counts, this method divides the unknown students by the number of suppressed cells and distributes that amount among them, even if that means distributing a fraction. * Full disclosure: I have worked previously for the ELC. Our government has this very popular thing: they like forgetting about very important things. As for me, it is just unacceptable to forget about special education students. These are poor kids who already suffer enough. I just don’t get it how people with so many abilities refuse to help these children. No one is asking you to study for them. Unlike an average students these children are hard-working ones who will write their own college level papers (yes they can do it), instead of applying to EssayOnlineStore. This country is a mess. Hopefully, the situation will be fixed somehow. And wouldn't it be helpful if the National Council for Exceptional Children would advocate for them, rather than pander to Arne Duncan (which they do, year in & year out)? Where ARE you people--ducking your responsibility to your raison d'etre. ENOUGH--stop the monologuing & start the advocating! !